Just 2 Birds: Healthy Challenge - Day #29 -- Healthy Substitutions! 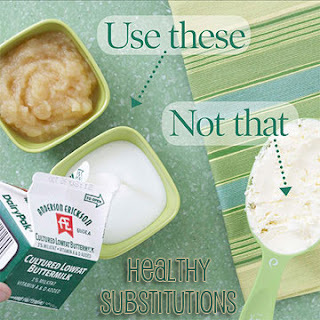 Healthy Challenge - Day #29 -- Healthy Substitutions! Health is created in the kitchen, not in the gym. We will often destroy our health by what we eat. I know I'm guilty of heading to the gym and then ending up with a spoonful of ice cream. So what do we do? So many of our favorite recipes and the recipes that our families (or husbands) will eat are packed with some pretty bad ingredients. In comes some healthy substitutions to please our appetite and our bodies. When I'm making a sandwich I use the a laughing cow cheese instead of mayo. They're only 30 calories each? !